The Spanish ambassador to London has been summoned to the UK Foreign Office after Britain lodged a protest about recent Spanish incursions into territorial waters off Gibraltar. Britain's Europe minister said there were two "serious" incidents on Monday. David Lidington said a Spanish naval vessel had patrolled Gibraltarian waters and Spanish customs had also attempted to seize a civilian boat. 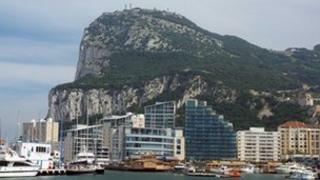 He warned Spain to halt "provocative incursions" into Gibraltarian waters. Spain has long contested the sovereignty of Gibraltar, a British overseas territory at the southern end of the Iberian peninsula. On Monday, Mr Lidington said a Spanish naval ship conducted a patrol lasting several hours through British Gibraltar waters. He said, later on the same day, a Spanish customs vessel tried to apprehend a Gibraltarian civilian boat in territorial waters. The Royal Gibraltar Police had to intervene "to safeguard the welfare of the four occupants", he said. The incidents come after ministers last month made formal complaints to Madrid about "unacceptable" actions by the Spanish authorities at the border with Gibraltar, which led to delays of up to six hours. Foreign Office permanent under-secretary Simon Fraser has summoned Spanish ambassador Federico Trillo over the latest incidents. Mr Lidington said: "I condemn these provocative incursions and urge the Spanish government to ensure that they are not repeated. "The UK has repeatedly made diplomatic protests to Spain over attempts by Spanish state authorities to exercise jurisdiction in British Gibraltar territorial waters. "Yet on 13 November there were two further serious incursions." He warned that such incidents risked damaging "the prospects of developing a harmonious and collaborative relationship between Gibraltar and Spain. "It is also in all parties' interests to avoid incidents which could put at risk the safety of those operating in British Gibraltar territorial waters," he added. "We remain confident of UK sovereignty over British Gibraltar territorial waters and fully committed to protecting the interests of the people of Gibraltar and their wish to remain under British sovereignty." William Dartmouth, the UK Independence Party MEP whose south-west England constituency includes Gibraltar, welcomed the move. "I am delighted that Mr Lidington has made a start, but he mustn't let it lie there. He must keep up real pressure on Spain," he said.